„Melissa“ non-irrigated vineyard among the olive orchards, 0.2 hectares, altitude 505 meters, by the village of Zinta on Crete. 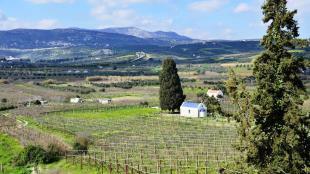 Typical Cretan terroir, surrounded by wilderness. 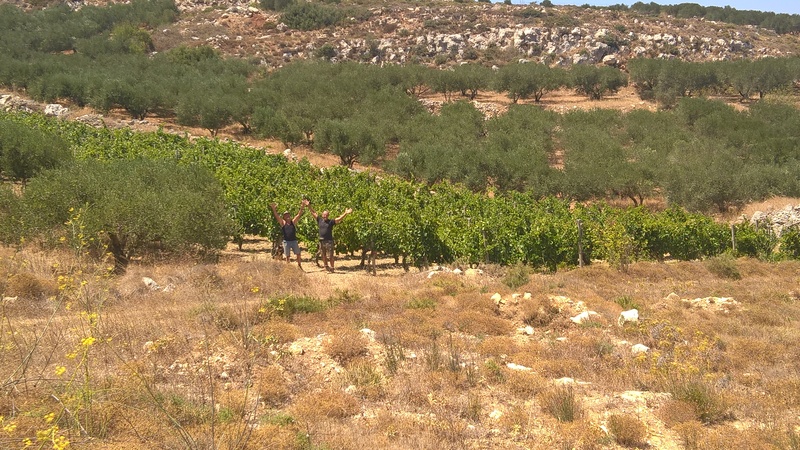 Nikos Kontaxakis, winegrower -owner of the vineyard with Kostas Bouyouris, agronomist of Local Food Experts, after the application of horsetail water extract. Nikos Kontaxakis is a winegrower of the “Saint August” group, participating in the Sustainable winegrowing project of FUTOURIS e.V. on Crete. Horsetail (scientific name: Equisetum arvense L.) is a common weed in many Cretan vineyards. Nikos has been a neighbor with the Horsetail for years, but he did not appreciate Horsetail at all. “I know this plant… it is a permanent resident around my vineyards. It can become a disturbing weed if I do not rotate the soil in proper time”, Nikos murmured once he saw horsetail on the screen, during one of the training seminars taking place in the ΛYRARAKIS Wines cellar and entitled „The use of wild plants with pest control properties in sustainable winegrowing“. Nikos had just offered valuable information to the agricultural technicians of LOCAL FOOD EXPERTS sce, the local co-ordinators of the project; he spotted the presence of a plant species with pest control properties in the surrounding vineyards. The water extract of horsetail has a high content of silicon (Si), an element that enhances the resistance of plants in biotic (pests, diseases) and abiotic factors (water and heat stress, climatic changes, soil salinity and more) (for citation click here). Nikos Kontaxakis, winegrower from the “Saint August” group and Sotiris Di. Bampagiouris, agronomist of Local Food Experts, harvesting common horsetail around the vineyard. Ten kilos of horsetail was harvested by Nikos and Sotiris, one of the agronomists of the project on June 5, 2016. The horsetail was soaked in 100 liters of water in a barrel, for 15 days under the strong Cretan sun. On June 20, the water extract was cloth filtered and stored, in order to be ready for dilution (1:10) and field application. 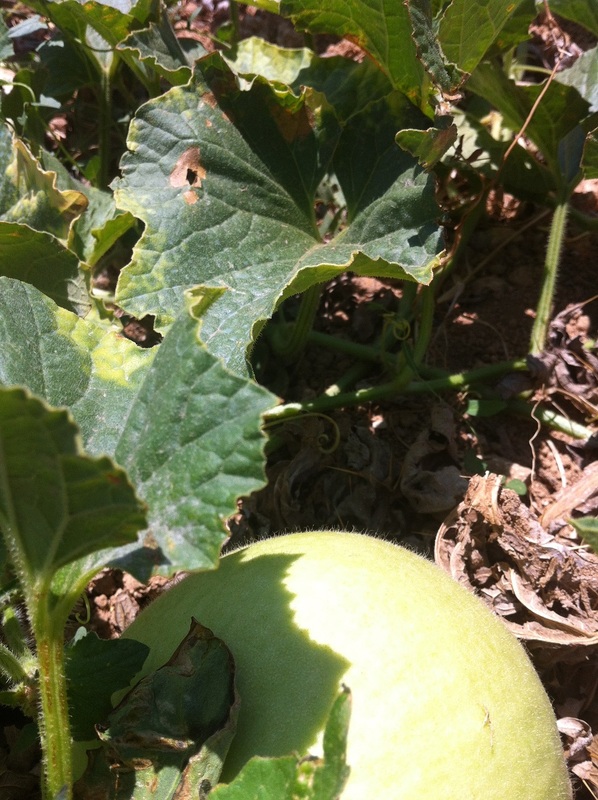 Honey melon plant used by Nikos as a “private field trial” of horsetail water extract. Diseased dried out old leaves are seeing on the right. Dried out disease spots are on the old green leaves (center of photo). Nikos sprayed the horsetail water extract on his vineyard on July 10, 2016 under the instructions of the agronomists. His major concern was the fungi vine disease of powdery mildew (scientific name: Uncinula necator (Schwein) Burrill). Three more winegrowers, with seven vineyards of total surface 1,3 hectares participated in this experimental field trial. Results are expected to be recorded. “Getting to know your neighbors can lead to synergies”. Nikos and the horsetail are now close friends, at least according to Nikos point of view! An ordinary weed has been turned into a valuable companion. A tool of nature is in use.